Collect all your favorite Tweets in the palm of your hand. moments by creating a unique book gathering their one hundred most popular posts. Collect all your favorite Tweets in the palm of your hand. 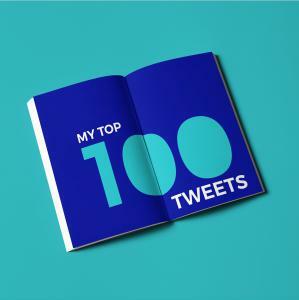 “My Top 100 Tweets” is a truly unique tool for social memorabilia targeting Twitter users and business professionals who want to preserve some of their greatest social moments. BlookUp easily and instantaneously imports up to 3,200 tweets from a user’s Twitter feed and automatically identifies and extracts the most popular ones of a given period, creating a Twitter best-of. “My top 100 Tweets’’ is a collection of ranked Tweets in descending order, from number 100 to number 1, to maintain suspense up until the very end! The ranking relies on an algorithm that analyzes the user’s most liked and most re-Tweeted posts. The printing layout is then automatically generated. ‘’By linking social media networks at large to books, we invite our users to step back and appreciate the mood board of their content on a timeless medium,’’ says Philippe Bruno, Founder, and CEO of BlookUp. ‘’After offering blog books, Facebook books, Instagram books, and Tumblr books, we are proud to introduce Twitter users to an exclusive selection of their most popular Tweets. Turning a page is more entertaining and enduring than scrolling a timeline!’’ concludes Philippe Bruno using a metaphor. one to two weeks within order confirmation. 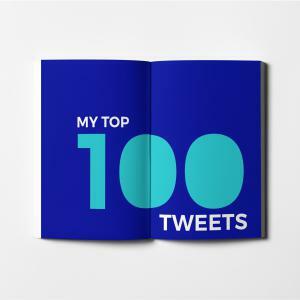 ‘’My Top 100 Tweets’’ is available for order on www.blookup.com at $22.00 per copy. account. BlookUp delivers books globally.